The boast is an incredibly useful shot for the novice player. It’s a shot that sees the ball hit the side wall before the front wall, and finishes up at the front of the court. It’s a shot that should be practised very early on during your squash career, as it gives you the ability to dig the ball out of the back corners as well as to manoeuvre your opponent to the front of the court. The boast can be used as both an attacking and defensive option from the back corners, or as an out and out attacking option the further up the court you get. It can be highly effective once you’ve developed a consistent and reliable technique, but it should not be overused as it can open up the court and can give your opponent free space from which to attack if played badly. 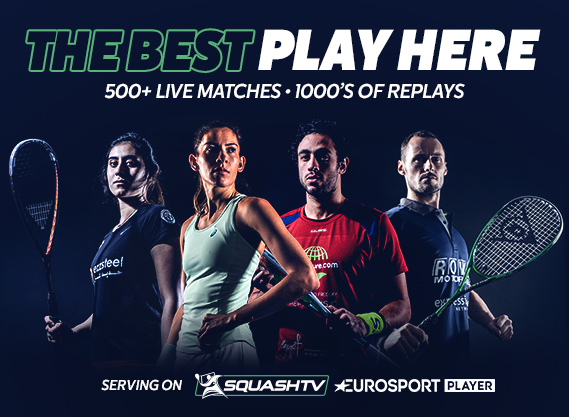 Welcome to the SquashSkills Zero to Hero series. The aim of this set of videos, blogs, and emails is to provide a course like structure that helps players to work on the fundamentals of the game in a way that makes sense for them. Despite squash being a relatively simple game on the surface, once you delve into the deeper complexities of the rules there are elements of the game that can be difficult to get your head around. How you pick up and hold your racket is one of the primary elements that needs to be firmly in place as a foundation of your technique. The fundamentals of the grip and related elements need to be solid in order to allow you to hit the full range of shots that are needed on the squash court. Unlike sports such as golf or cricket, squash players are faced with the need to develop two swings, one on the forehand and one on the backhand. Generally, the forehand swing is considered easier to get started with whilst the backhand swing becomes easier to master over time. If you’re brand new to the game focus on hitting on the forehand to build some confidence but do ensure that you pay equal attention to the backhand as this is where the more of the game tends to get played as you become more proficient. 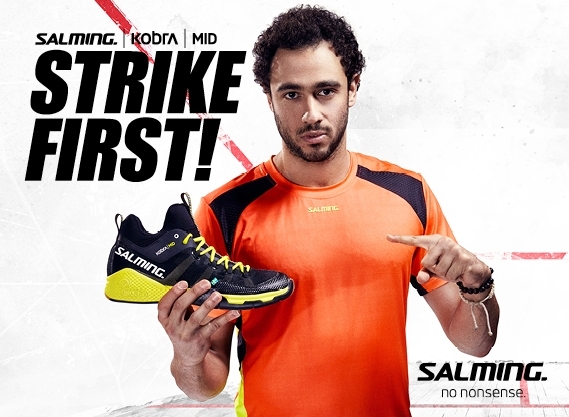 The straight drive is the single most important shot in squash. It’s a ball that’s hit to run parallel along the side wall and land in the back corner. Your movement on and off of the ball is a key part of hitting your shots with consistency. It’s an essential shot because it ties your opponent up in the back corner, often limiting their swing due to the fact there are two walls running in opposite directions. It’s a shot that gives you the opportunity to get in front of your opponent and take control of the middle of the court. 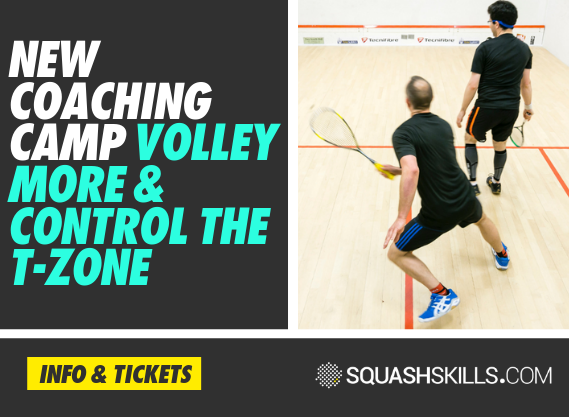 The serve and return are essential components of the game of squash, and you need to be able to do both with equal competence to improve your overall playing standard. Developing a good serve is a key part of your squash progression. A lot of players think of the serve purely in terms of getting the ball into play, when it’s actually a great opportunity to immediately put your opponent under pressure in a rally. Equally, developing your ability to hit a good return of serve will accelerate your improvement, as you’ll give away less cheap points and easy winner opportunities to your opponent. There’s no doubt that you need to have a basic handle on technique in order to maximise your tactical options. It’s a tough task to be able to consistently put the ball in a certain spot time after time if your technique breaks down, that’s part of the reason that this article sits lower down in this series than some of the fundamental technique videos. A volley is any shot taken before the ball bounces. It is a very useful shot to develop, as it allows you to far more effectively control your opponent and will also help limit the amount of running you need to do. If you watch high-level squash you’ll realise how important the volley is – players are constantly looking to stay in front of their opponents and stay in control of the T zone, as this means that they do less work chasing around the court, while also constantly taking time away from their opponents by hitting the ball early. The drop shot is a soft shot that lands at the front of the court. It is considered an attacking shot with players often looking to use it to finish off rallies. We use it to hit winners at the front and to manoeuvre the ball around the court to make our opponents have to cover as much ground as possible, forcing them to move from the back to the front of the court and vice-versa. The lob is primarily a defensive shot (though it can also be used in attack), that is played high and soft on the front wall to create time and alleviate pressure. There is a big open space high above the squash court that can be brought into play very effectively with the lob. it’s a tough shot that requires delicate hands and control over your ‘weight of shot’ so that the ball doesn’t fly off out of court, but used properly it can be a great way to switch defense into attack in an instant. The goal of the warm-up is to optimally prepare your body for physical activity, which will allow you to get the very best from your training session or match ahead. In such a demanding, high-intensity sport as squash, it’s a key part of the performance puzzle. ‘Fitness’ is comprised of many different things. A lot of players still think of fitness mainly just in terms of ‘endurance’, or how long they can keep running for before fatigue slows them to a halt. Squash has its own unique movement patterns that are a fundamental part of the game – to become fully conversant with them requires time and effort. Squash is a tough game, so moving around the court as efficiently as possible is crucial. Linking your movement to your shot will also help with quality and consistency.